For many years I dealt with this by wearing gloves while shooting, but as we all know, you train as you fight, gloves are not always an option. So I went on a search for a solution that would allow me to train in all weather without relying on gear that may not be available in a defensive encounter. 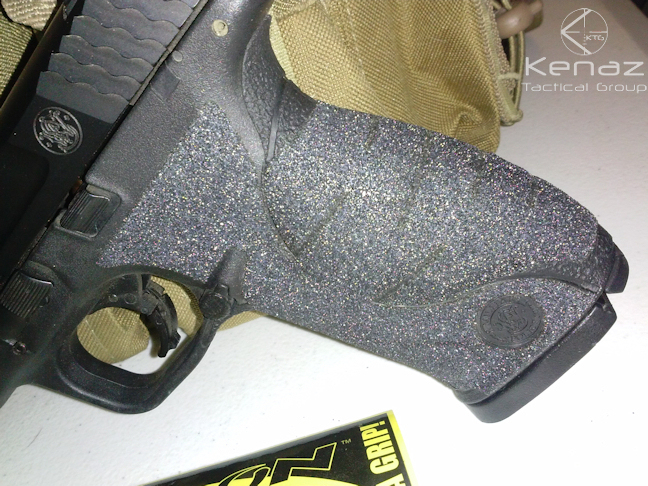 One option I had considered was “stippling” of my pistols grip, while this is a great option, it’s typically very expensive and permanently alters the firearm. Furthermore, finding a good applicator is a search in and of itself. There are many examples of firearms that have been ruined by poor technique. After consulting many of my colleagues and associates, another option was suggested; Talon Grips, a non permanent textured wrap that adds the additional grip needed to overcome slippage issues caused by moisture on the grip. Made in the USA and located in Steamboat Springs, CO, Talon Grips are custom laser cut for almost all popular pistol and rifle grips. 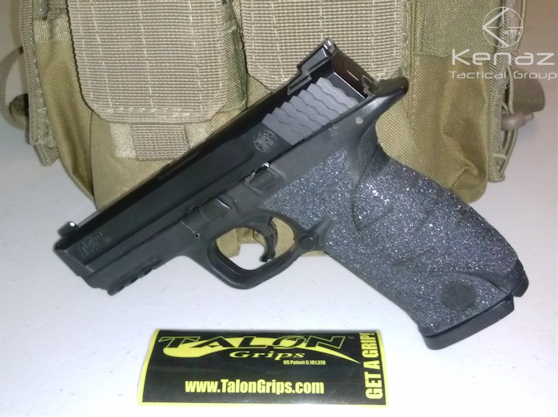 Talon Grips come in two textures, granulate, which has a very pronounced sandpaper feel and rubber which has a much less aggressive feel while still improving the grip in all weather. Installation of the grip wrap is simple, straight forward and fit is perfect. The quality of cut and material is top notch and with proper preparation and installation, these grips will last even in the hands of the most avid shooters. My personal experience has been very positive. I have noticed an marked improvement on my presentations, speed and accuracy as a result of the increased grip, even in normal conditions. The only downside is that the granulated grips tend to ‘stick’ to clothing. If your application is a concealed handgun, I highly recommend purchasing the rubberized grip to ensure clothing is not snagged by the grip on presentation. With a retail price of around $18, you cannot miss with Talon Grips. Highly recommended by Kenaz Tactical Group. Robert Butler is the Owner and Chief Firearms Instructor for Kenaz Tactical Group and an NRA Certified Instructor in 6 disciplines. Robert also works in the Firearms industry as the Director of Product Development for Tactical Black Firearms. Further, Robert is an 18 year veteran of the US Army and Army National Guard holding the MOS 12B and 13R.